We offer discreet shipping on all items purchased from Skyes the Limit. CocoTek Compressed bricks are composed of low sodium coconut coir and chips. Each brick will expand to about 2.5 gallons when re-hydrated with water. 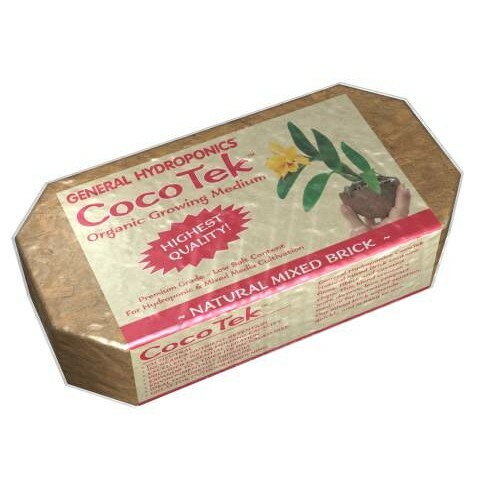 CocoTek Organic Growing Media is ready to use in a mixed brick (25% chips and 70% coir) or make your own blend by combining the Chip and Coir bricks. The Coir brick provides excellent water retention and the Chip brick improves aeration. A custom mixture of the two creates an ideal growing medium for a specific growing environment. Do you need information on growing? See our Grower Resources section to find all of the infomation you need. Get information oon all of your lighting questions, Feed Schedules, Measurement Conversions and more! Do you have questions on this product? Please feel free to call us with all your questions about this and other products. We are happy to assist you.